Every so often, a customer service story is handled so wonderfully that it reaches far beyond the initial customer. 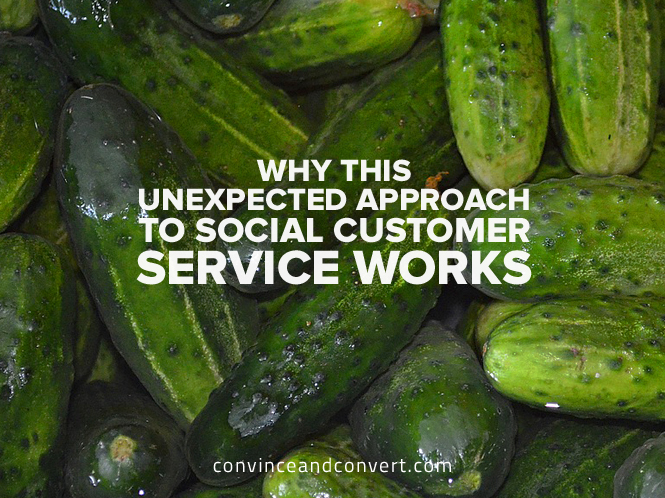 This is the case with a recent social media customer service interaction between Tesco UK and a customer who discovered a dead worm in his cucumber. At first glance, the image is jarring. 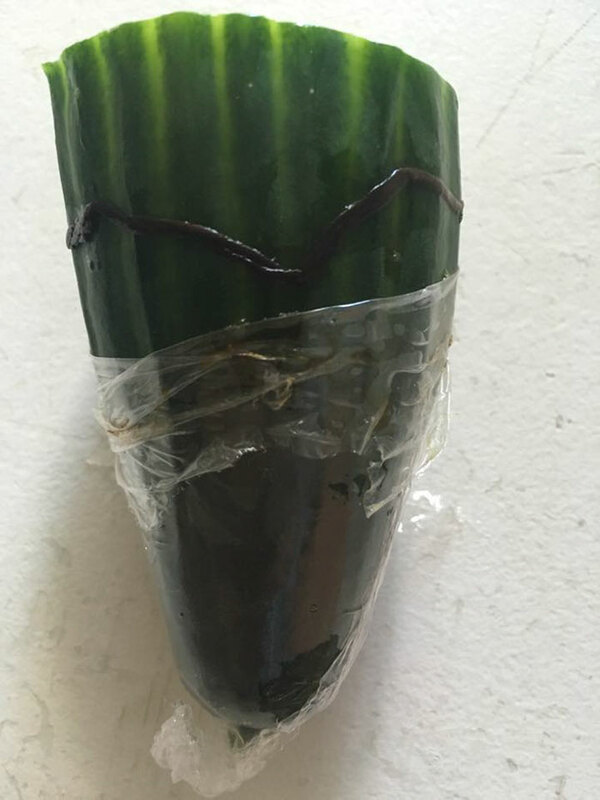 Imagine eating your way through a cucumber only to discover a dead worm attached to bottom. Instead of laying into Tesco, like many consumers would do, the customer here took to the Tesco Facebook page with a healthy dose of humor to file his complaint. 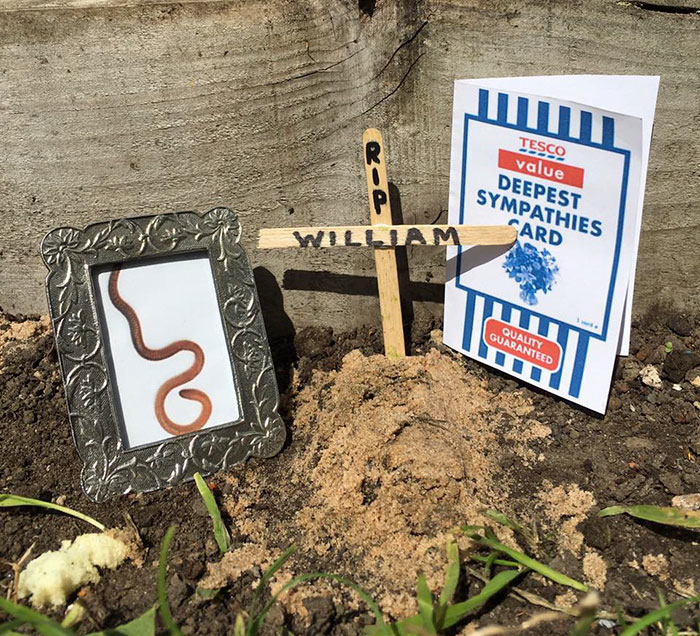 While Tesco’s could have easily responded with a formal or “stock” customer service message, the company’s social media customer service team rose to the occasion with a response and “Ode to William” the worm that was equal parts heartfelt and humorous. And it didn’t stop there. 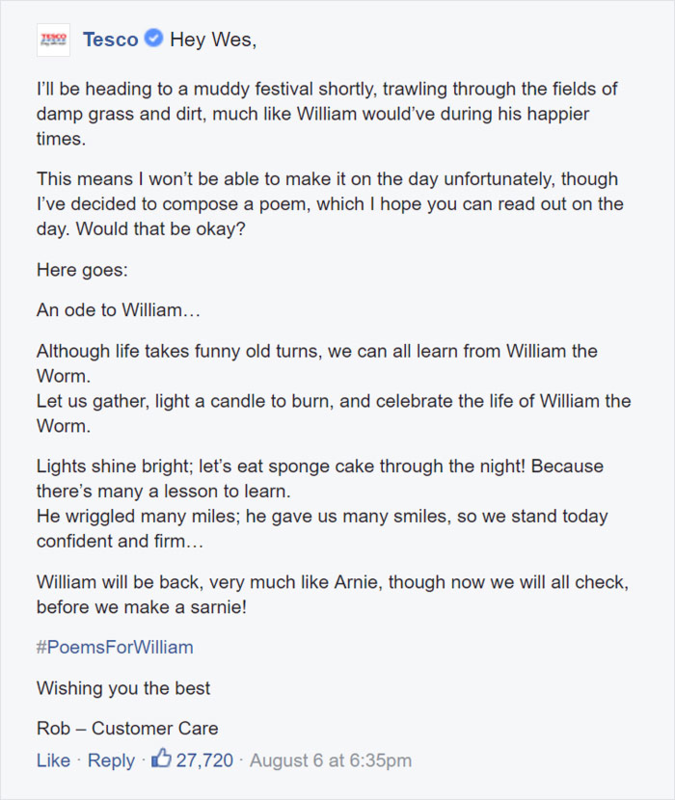 The interactions between Wes the customer and Rob from Tesco’s customer care team went on for the next 48 hours and included a proper funeral for William the worm, more poems, and song lyrics, all with a healthy dose of humor. Visit the original post from Wes on Facebook, and you’ll see that this post has been liked 91,000+ times, with 45,000+ shares and another 14,000+ comments. 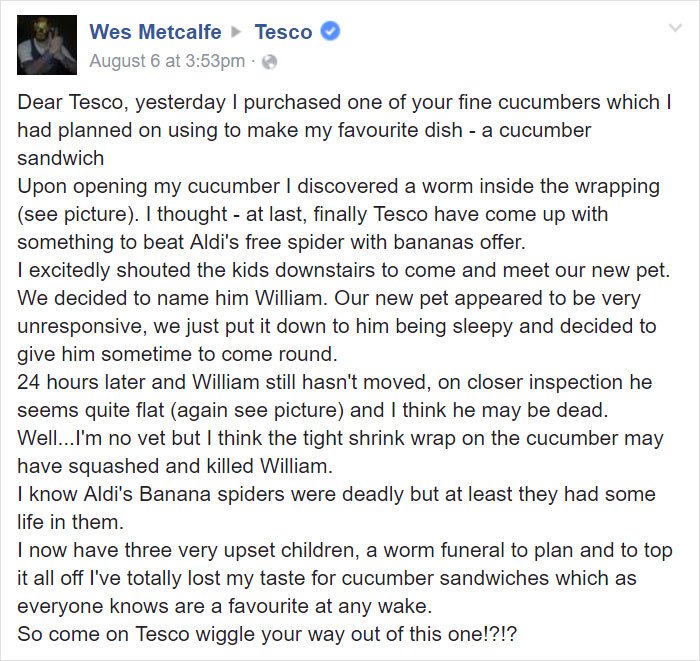 Subsequent responses from Wes and Tesco have also received tens of thousands of likes and comments. So what can you learn from this clever customer service win? It’s easy—and, candidly, not entirely unexpected—for a social media customer service team to respond to customer complaints with a stock response. Often times, customer service teams do this because it’s part of an established policy, governance restrictions, a volume issue, the need to efficiently process complaints in a specific timeframe, or all of the above. However, as Tesco’s response showcases, companies should not be so rigid in their processes that they miss opportunities to go above and beyond. 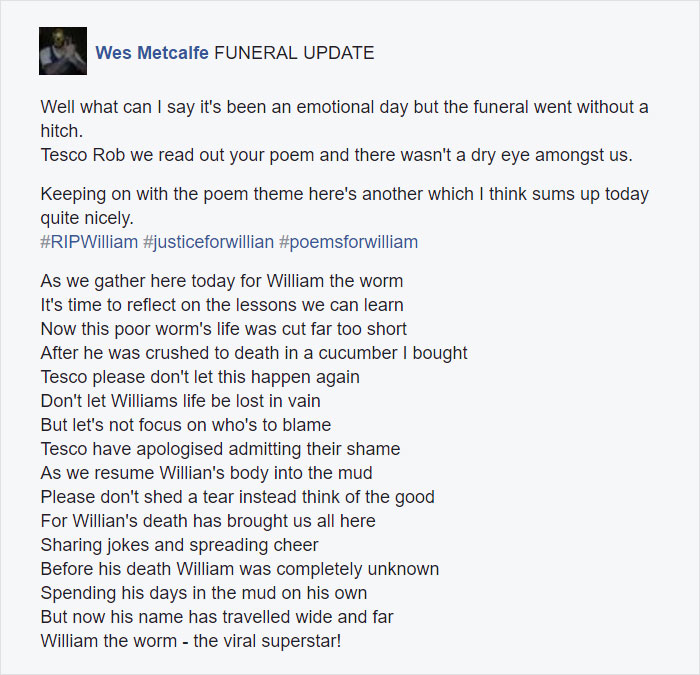 By rising to the level of Wes’s original response and expressing sympathy in a humorous way, Tesco was able to convert an unhappy customer into a brand advocate. While the above reasons and metrics are important in delivering social media customer service at a high level, so is knowing when to abandon them. Not only did Tesco convert an unhappy customer into a brand advocate, but the company has generated incredible amounts of goodwill among its customers as well, all through the positive press and social sharing of this story. Even if you’re not a consumer brand like Tesco, there are ways to infuse creativity into your responses. Whether it’s educational, how-to, or humor, consider taking a second look at the specialty skill sets of your customer service team. Chances are, your customer service team already has a variety of unique skill sets that can be used to deliver better responses and, ultimately, better customer experiences. Whether it’s a budding poet like Rob from Tesco, someone who can whip up a clever visual or source a clever GIF in a pinch, or a budding video creator, identifying and better assigning responses to the right reps will allow their creativity to shine while delivering better customer experiences. This is not the first time Tesco has responded to a social media customer service message with creative flair. More of Tesco’s clever responses can be found from a woman who recently purchased a hollow Scotch Egg and received a comical poem in response and a man who wrote a comical story to complain about the missing chocolate from his dairy-free ice cream, both of which also generated news articles and goodwill from customers. Wins like these offer a great reminder for all companies to ensure they are delivering consistency across all consumer-facing communications. If the social media customer service team is winning with clever responses that delight customers, perhaps the personality, tone, and spirit of those responses could also be reflected in other consumer-facing communications, such as general social media content. When it comes to delivering positive customer experiences, consistency across departments and channels is also key.